Please note that the configuration section of this Extension is moved to 'Customer Configuration'. This means you need to reconfigure the extension after an update. We are required to make this change to support multi-store environments correctly, where the 'Admin' configuration section is only accessible from the default store where we had previously set this extensions configuration section to. Please update to this release if you use MasterPassword. This is a release for use with Magento 1.4.0.x. and a maintenance update for MasterPassword. 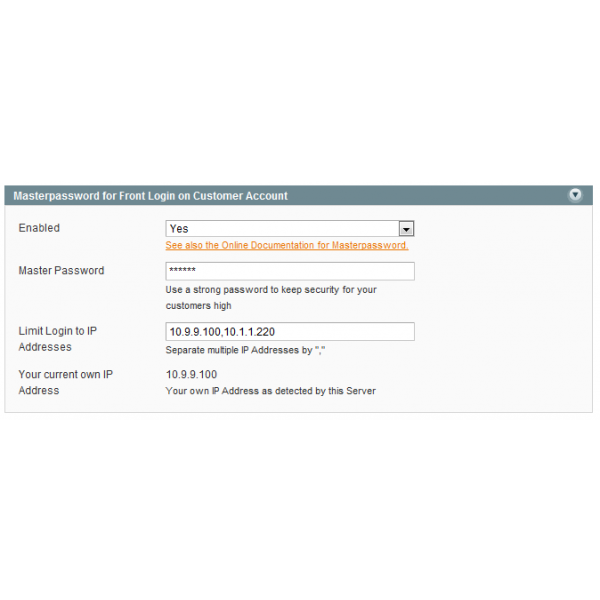 This update is addressing a possible difficulty to login into Customer Accounts with the Master Password. This is the first release for use with Magento 1.5.0.x. including all recent maintenance updates. This is the first release for use with Magento 1.6.0.x. including all recent maintenance updates.